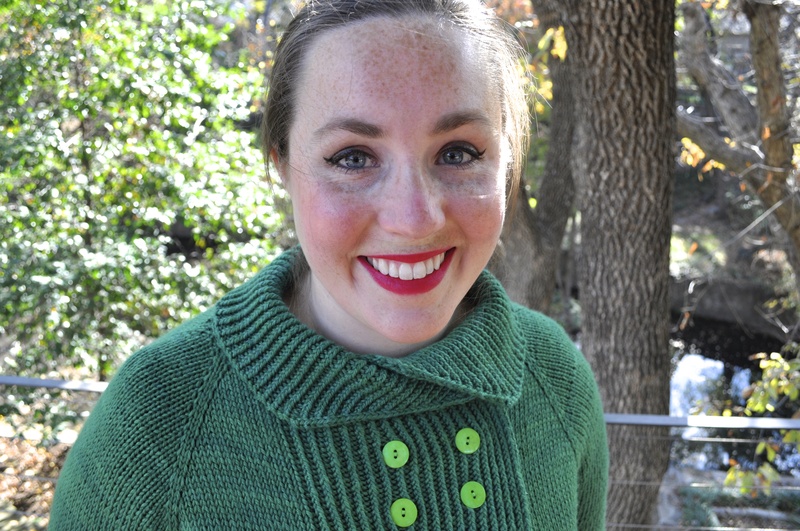 I am so excited to be releasing my newest pattern, a retro double-breasted cardigan called Jacqueline! I think the inspiration for the name is pretty obvious – I was definitely going for a vintage Jackie O look. 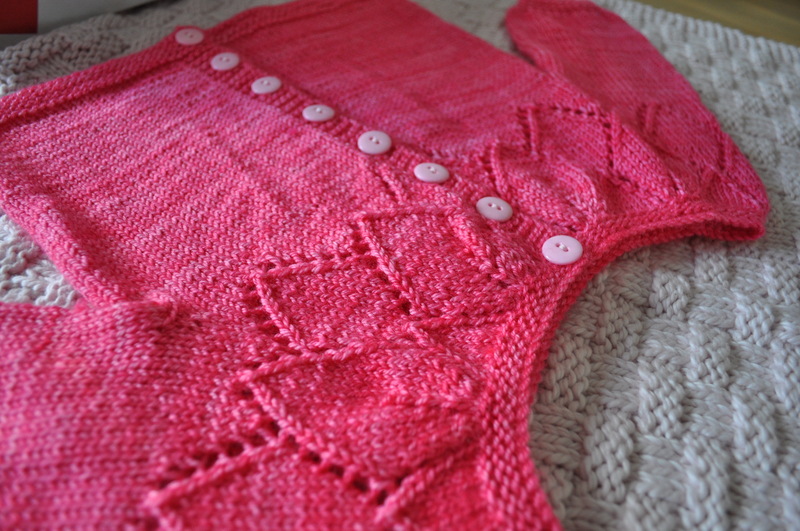 The body and sleeves of Jacqueline are knitted from the bottom up and joined at the underarms to work a traditional raglan yoke. A turned hem is worked at the bottom of the sleeves and body to create a clean edge. 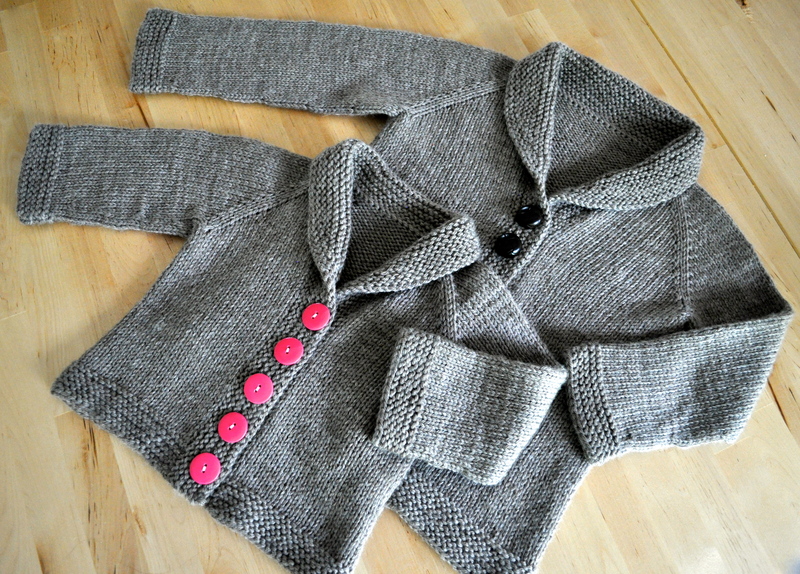 Twisted ribbing travels up the front of the sweater and six buttons make the closure. 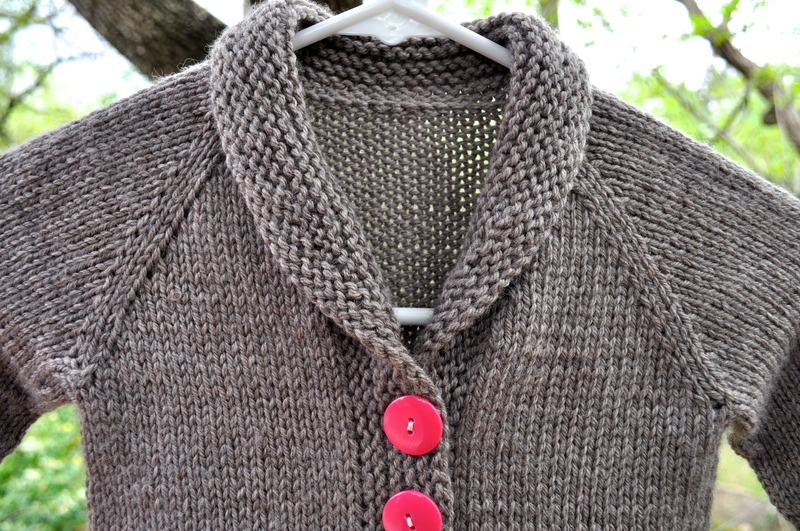 A fold-over collar (worked seamlessly from the body) gives a sweet and cozy finish to the sweater. 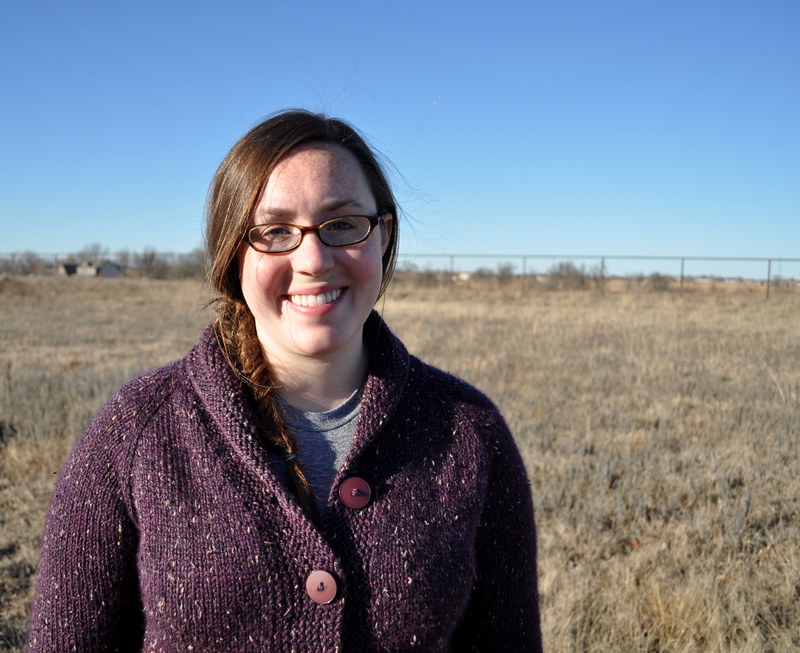 Three-quarter length sleeves make this a fall appropriate garment, but could easily be lengthened for colder weather. The pattern is offered in nine sizes, ranging from a finished bust measurement of 32 to 64 inches. 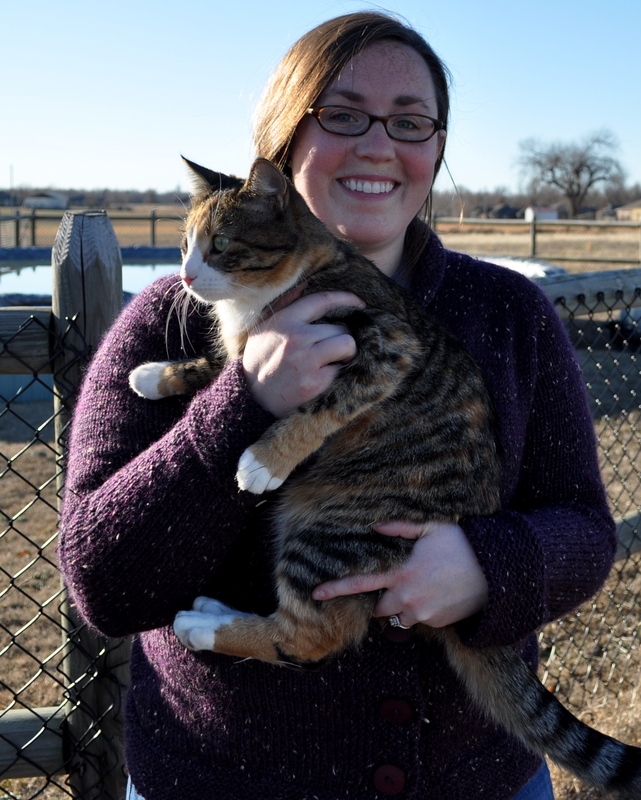 The sweater was designed to be worn with 2″ of positive ease at the bust. Jacqueline calls for a worsted or aran weight yarn and I used Lorna’s Laces Worsted Solid in Pine for mine. 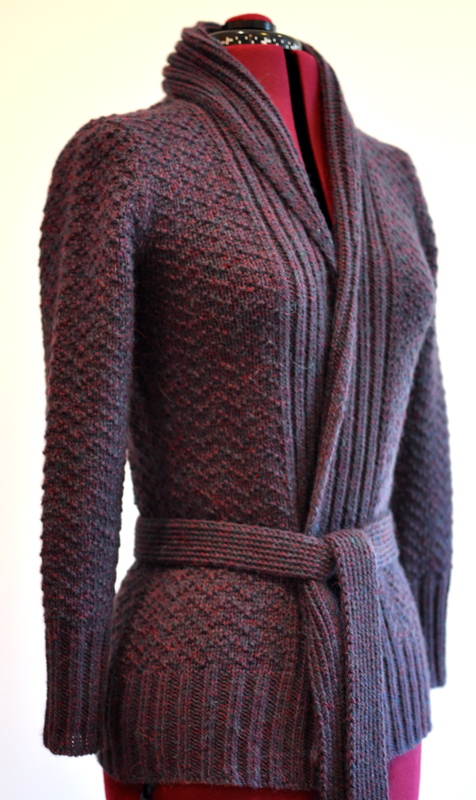 The required gauge is 18 sts/24 rows per 4″ in Stockinette stitch and 24 sts/24 rows per 4″ in twisted 1×1 rib. 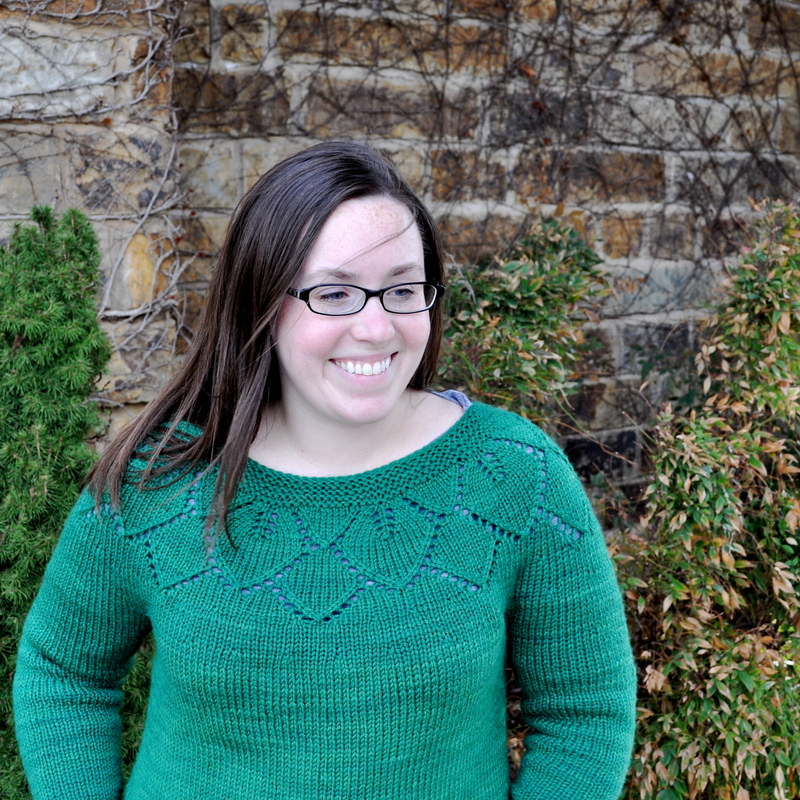 At such a large gauge, this sweater knits up very quickly! 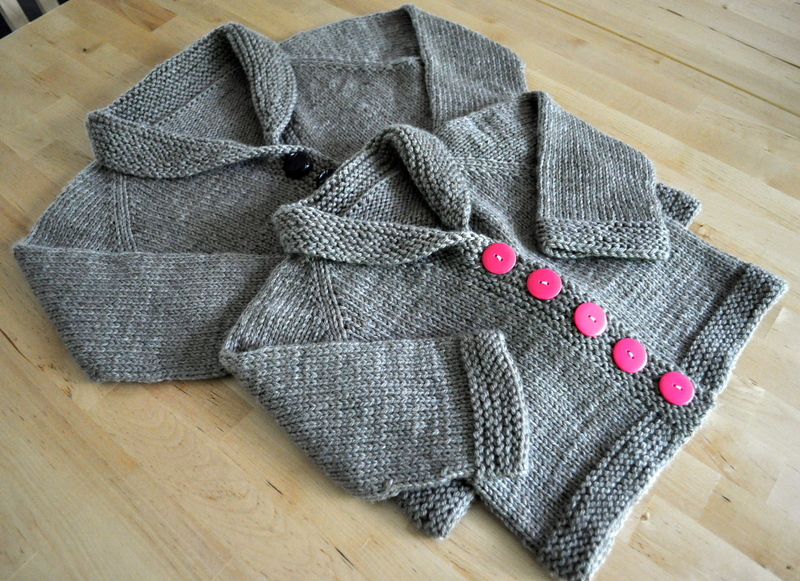 The pattern is available for 6.50 (USD) as a download in my Ravelry Store or through Paypal. Just click below! 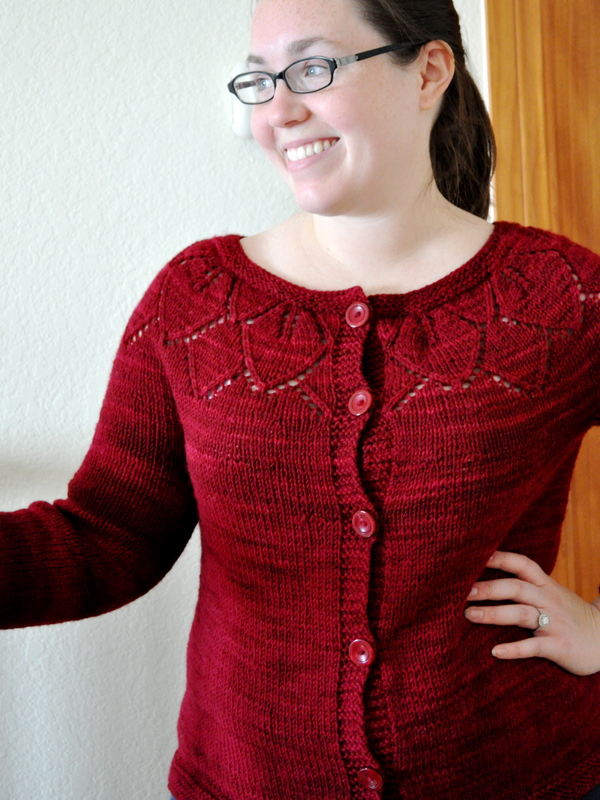 My very first pattern published in twist collective! I’m still pretty giddy from the whole thing, even though the pattern was accepted months ago and I’ve had to keep my quiet about it for, like, ever. 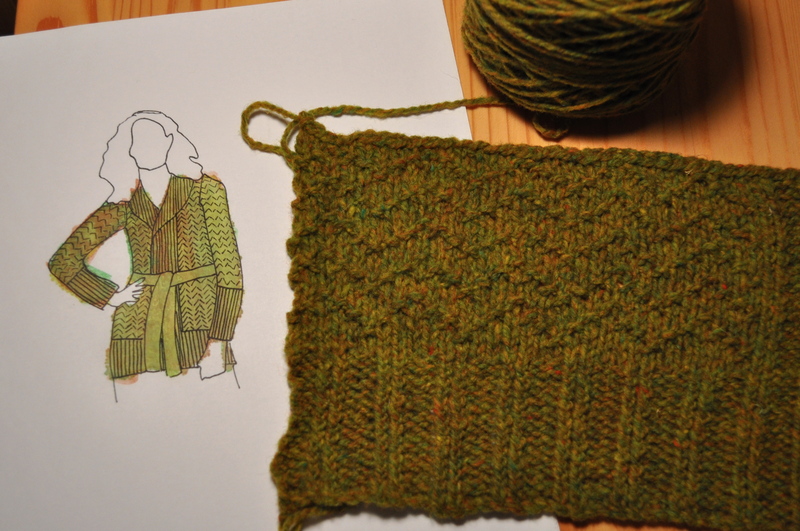 When I sent in my submission, I had actually already worked up the pattern and knitted a sweater for myself, but I also sent in a picture of my swatch and my sketch. You can see that as the pattern evolved from the sketch I decided not to make the collar quite as deep and I shortened the ribbing on the sleeves a bit. 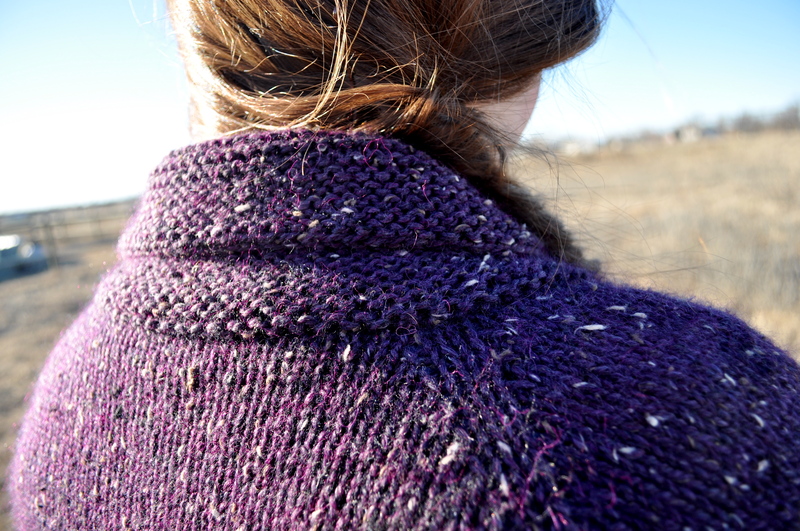 After the pattern was accepted, a few more changes were made in the next version and now we have Zenith! 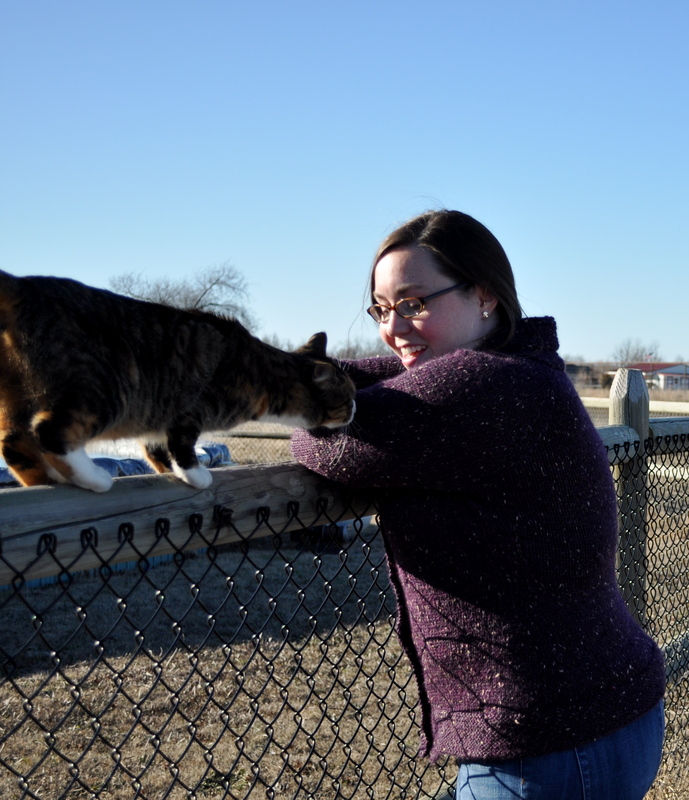 My main inspiration for the sweater was the super-trendy chevron thing that is going on right now and I wanted to repeat that pattern for a subtle texture all over the cardigan. 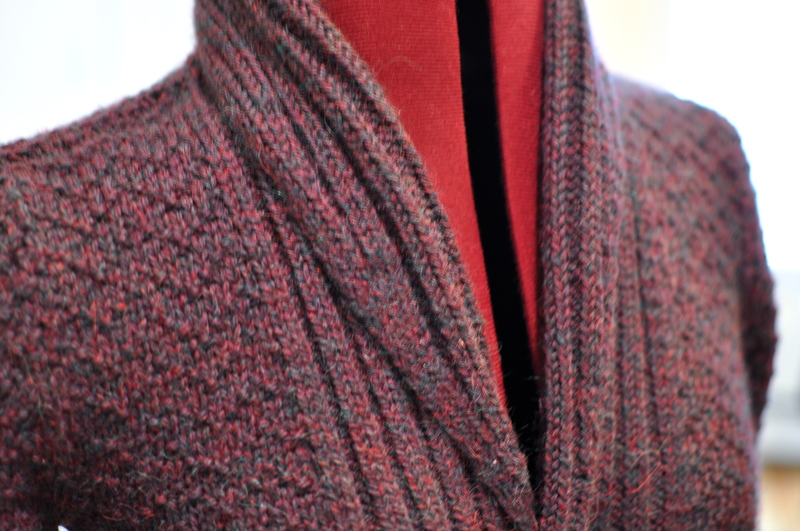 I was also going through a vertical twisted ribbing phase when I designed this sweater and you know I can never resist a shawl collar. 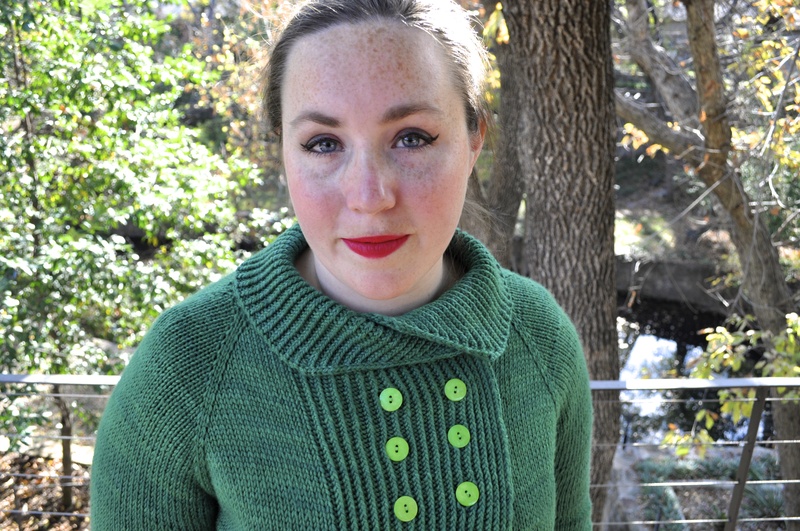 I started with figuring out how I wanted to work the chevrons, and I settled on a simple purl bump pattern. It took me a while to decide exactly how to do the ribbed collar because I needed the edge to look nice on both sides since it would be folded over. I finally decided to go with an i-cord edge that is worked simultaneously with the body. 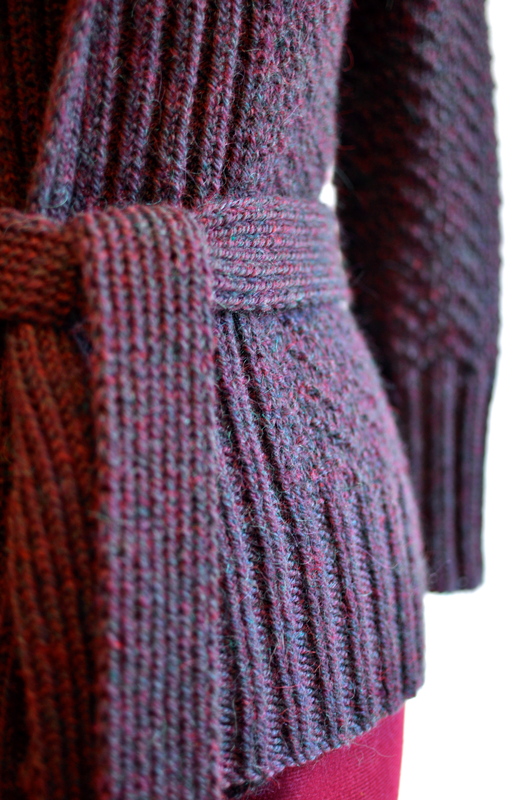 As for the construction of the sweater, it is knit in 5 pieces (6 if you count the belt) and seamed. 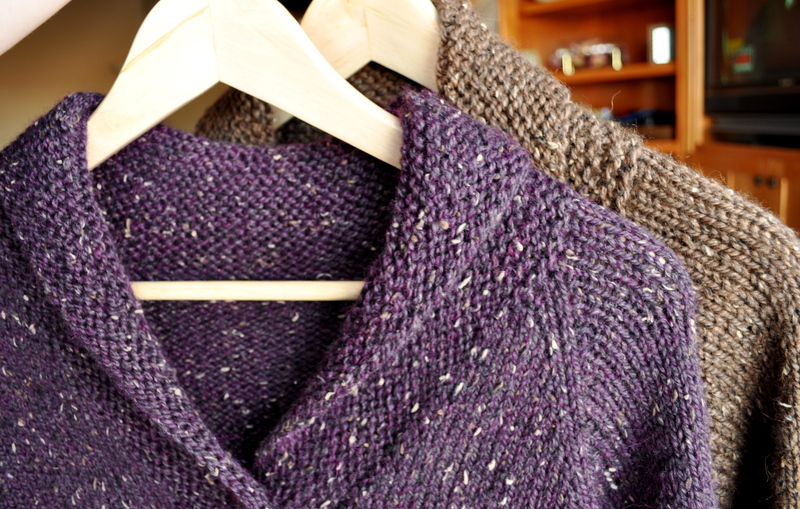 The sleeves are set in, and the shoulder seams are finished using a three-needle bind off. The ribbing for the collar is worked past the shoulder (imagine you place the shoulder stitches on a holder and then continue to knit only the ribbing so that you will have a strip of ribbing that extends past the shoulders) on both sides, then the collar pieces are joined at the center back neck with kitchener’s stitch and finally the whole collar is sewn to the back neck. I know that’s a long explanation, but I promise it makes sense as you’re doing it! 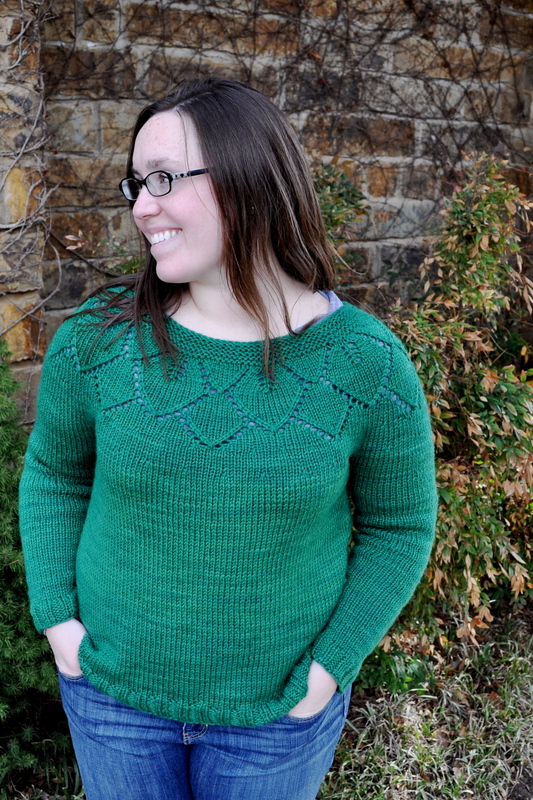 I’m so excited about this pattern and I really hope people like it and enjoy knitting it! The pattern is written for nine sizes, ranging from 34 3/4″ to 67 3/4″ bust. The yarn I used for the twist sample was the lovely elann.com Peruvian Sierra Aran in Plum Heather (be sure to check out the yarn website where Zenith is the featured pattern for this yarn and there is another picture of the sweater!) 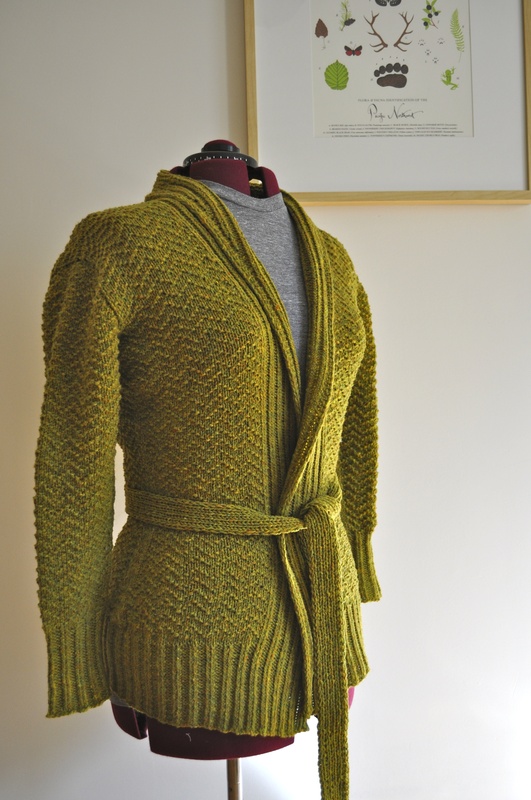 If you’d like to take a look at even more pictures, head on over to the pattern page on twist collective. 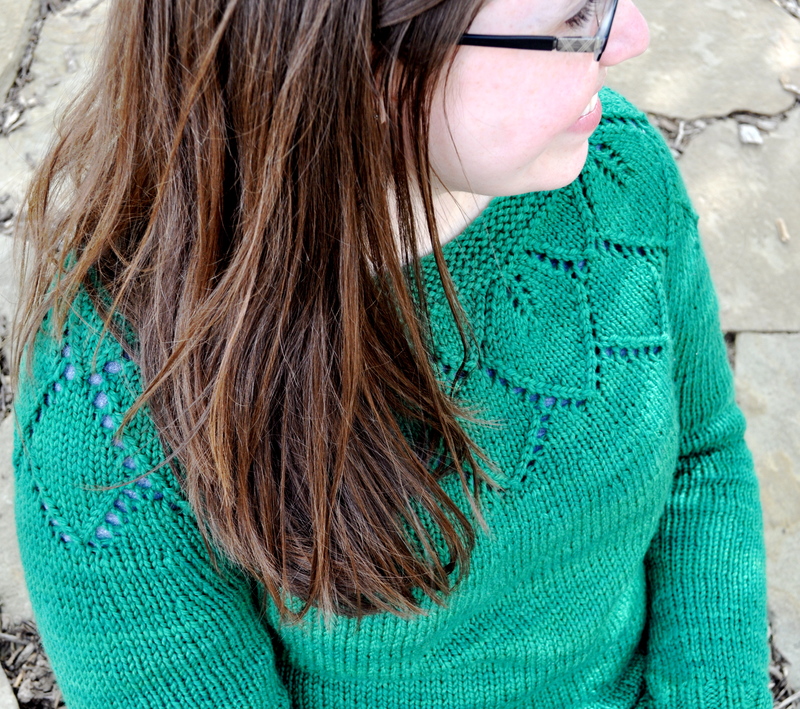 And don’t forget to look at the other amazing patterns in this issue! 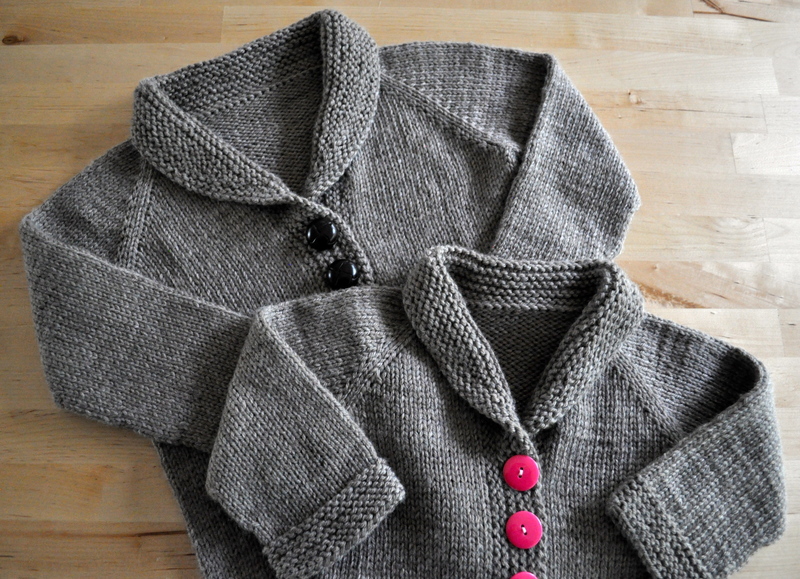 As soon as I published the Estelle cardigan, I realized that she would also make a lovely pullover – and had to start knitting immediately! 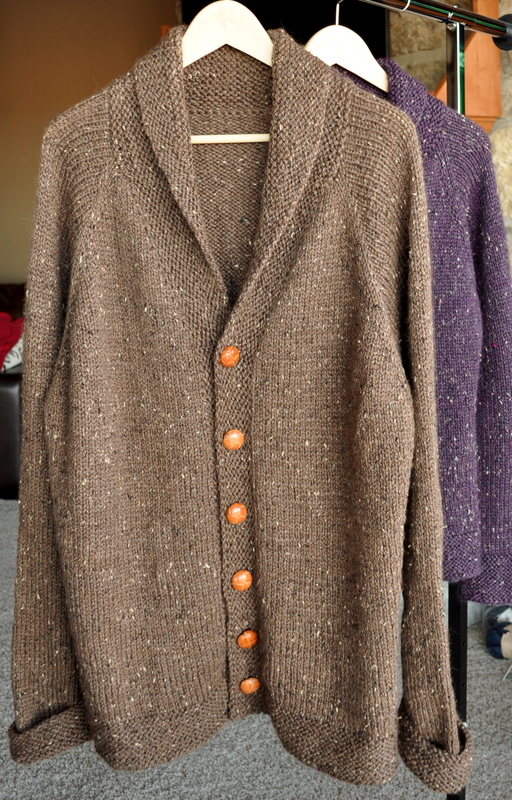 So, in case there were any like minded knitters out there, I wrote up the pattern for the pullover, combined it with the cardigan pattern and am now offering them both as a set. 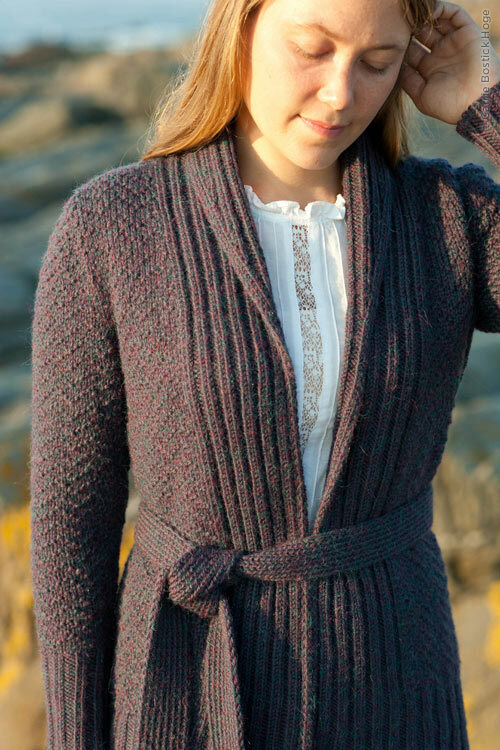 Anyone who purchased the original Estelle cardigan pattern will receive an update including the pullover and anyone who wants to purchase the pullover pattern will get the cardigan pattern to boot! Whew! 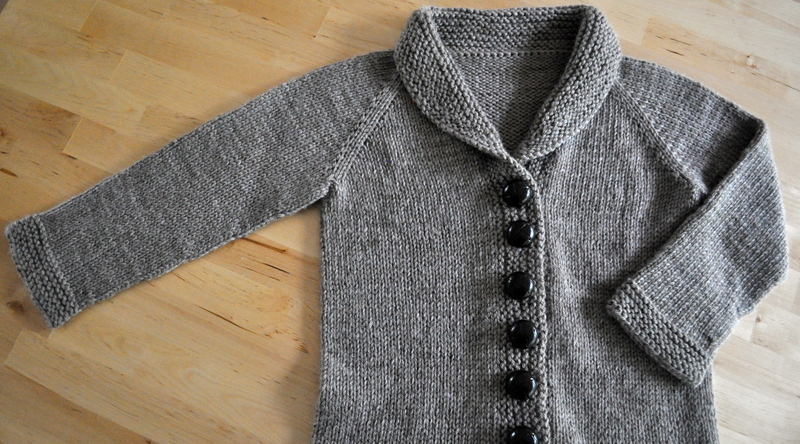 I just said “cardigan” and “pullover” about 138492395 times, so I’ll stop. Here are some lovely pictures of the . . . um . . . ok, the thesaurus is telling me I can also call it a slipover . . . 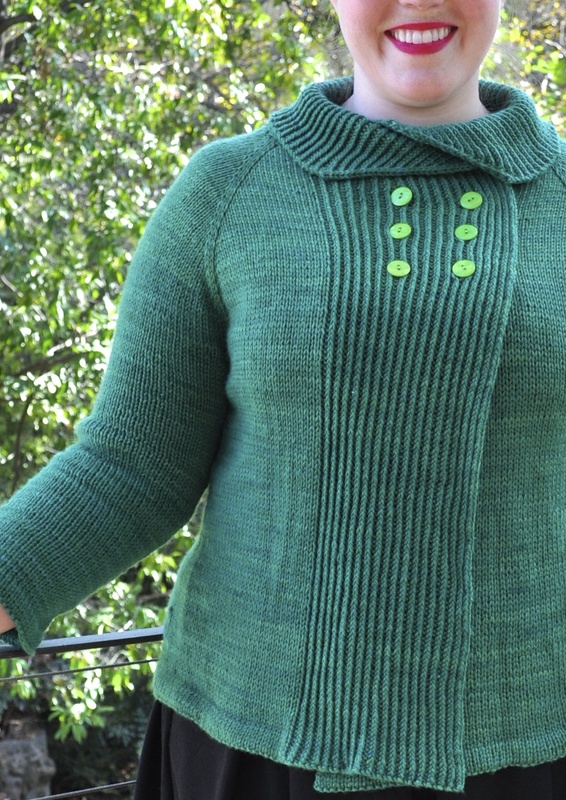 This version of Estelle is worked in Lorna’s Laces Shepherd Worsted Solid (mine is in Pine, a color that I am in love with). I’m currently obsessed with this yarn and may use it for every single project in the future. The gauge is still 17 sts and 24 rows per 4 inches in Stockinette stitch. 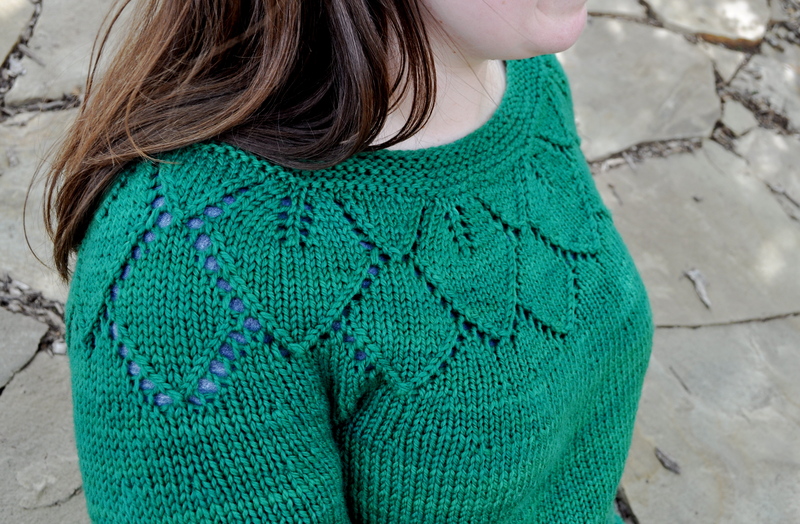 Lorna’s Laces is a bit plumper than the Araucania called for in the original pattern, and gives a nice thick and soft fabric. 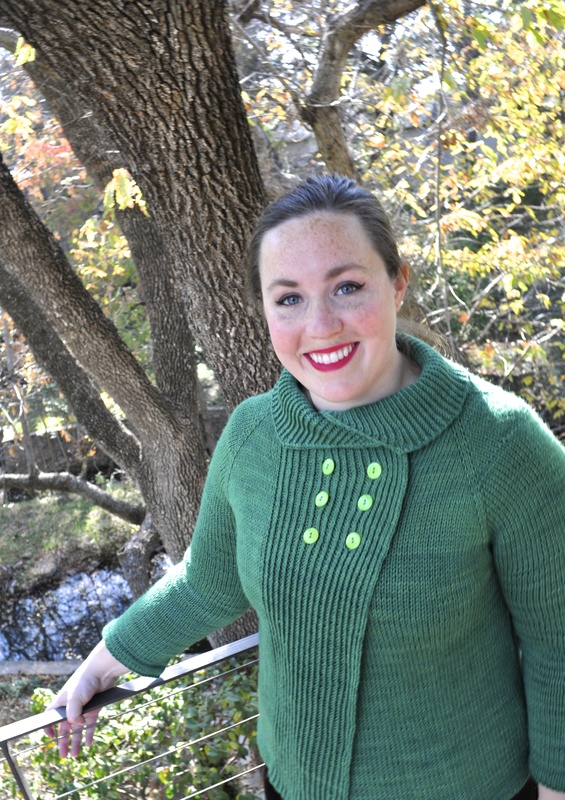 The pattern offers sizes XS, S, M, L, 1X, 2X, and 3X – which corresponds to final sweater bust measurements of 32, 36, 40, 44, 48, 52, and 56 inches. The lace pattern is charted and written out, so take your pick! Both patterns are available as a set for 6.50 (USD) as a download in my Ravlery Store or through Paypal. Just click below! My grandmother, Estelle, has always loved flowers. Her favorite color has always been red. I have to admit that when I first conceived of Estelle, I didn’t have my grandmother in mind – but once all the pieces of the design came together for me, I knew that Estelle was the perfect name. 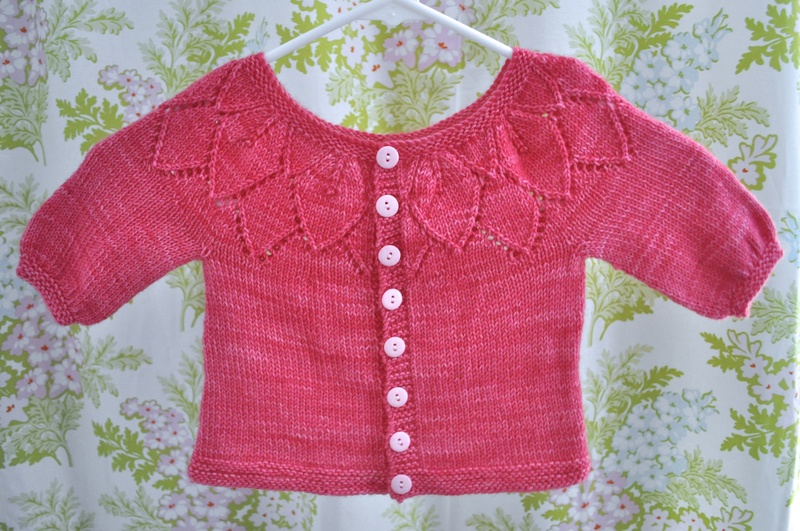 Estelle, or as I sometimes like to call her – flower yoke cardi, is a top-down round-yoke cardigan. 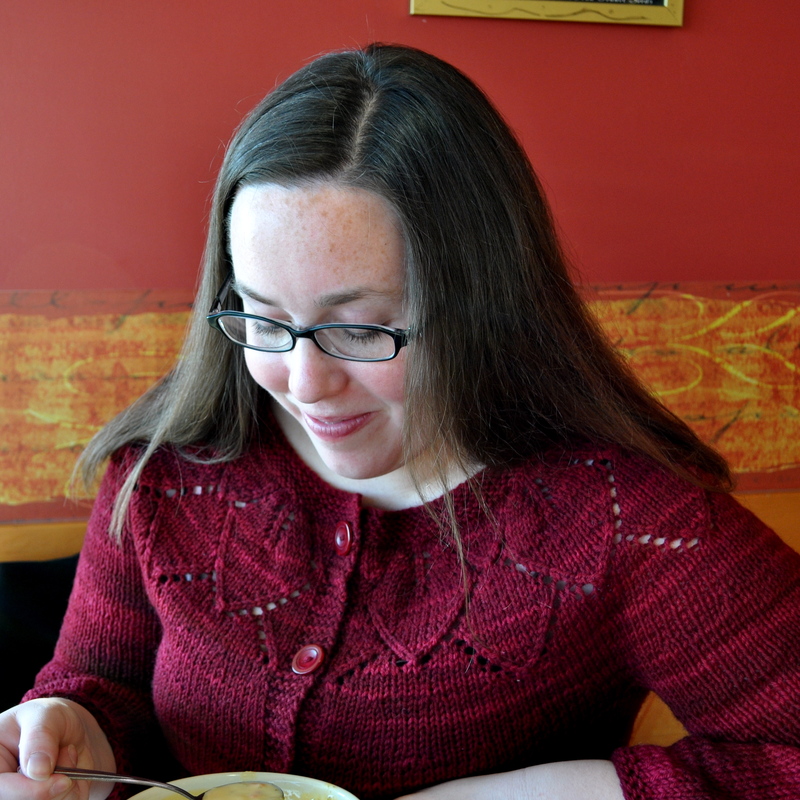 The sweater is knit in an aran weight yarn, so the knitting goes very fast. A large lace flower motif around the yoke and the slightly bloused sleeves make this a feminine cardigan with a little bit of whimsy. 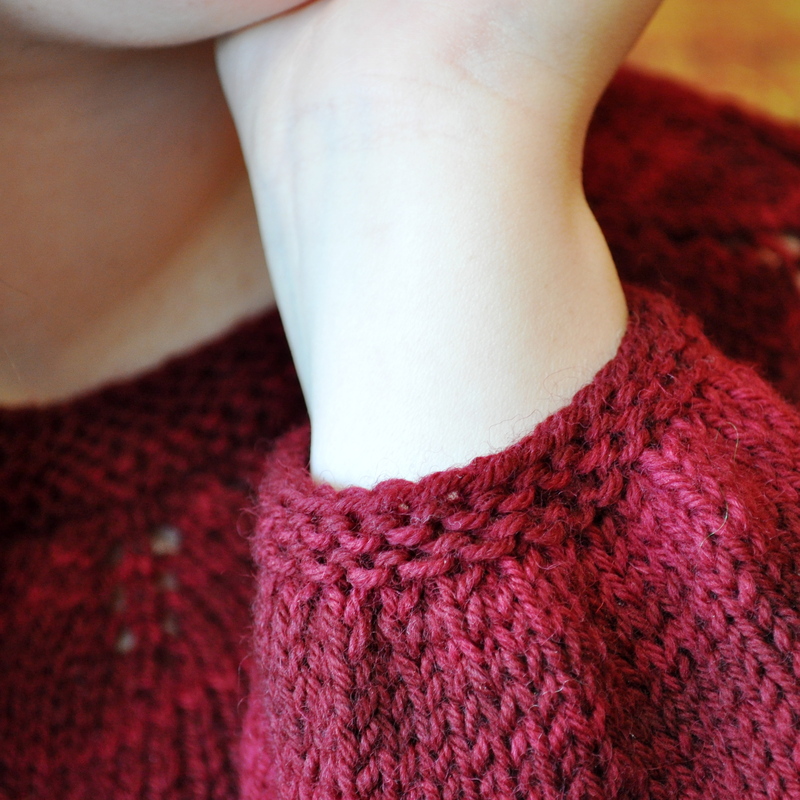 The neck of the sweater is wide, and you increase almost immediately to the stitches for the flower motif. 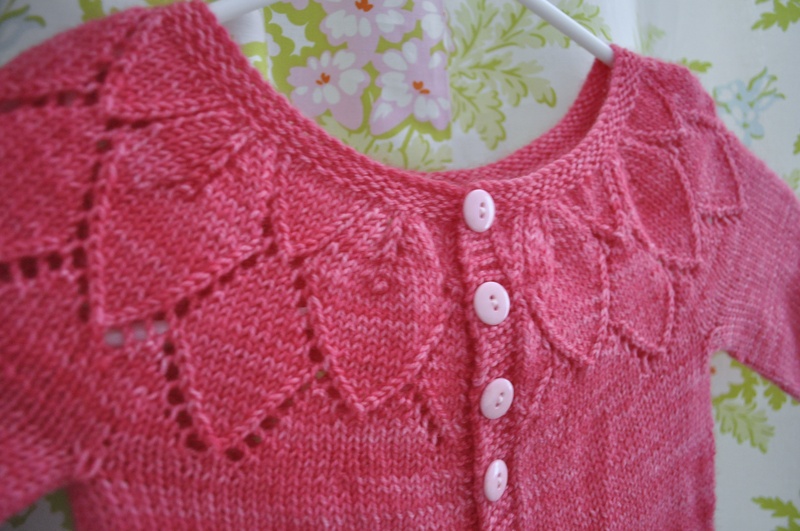 Once you’re past the yoke, the knitting of the body and sleeves is quite simple – just a little bit of waist shaping and some decreases at the sleeve cuffs. The gauge for the pattern is 17 sts/ 4 inches in Stockinette stitch. 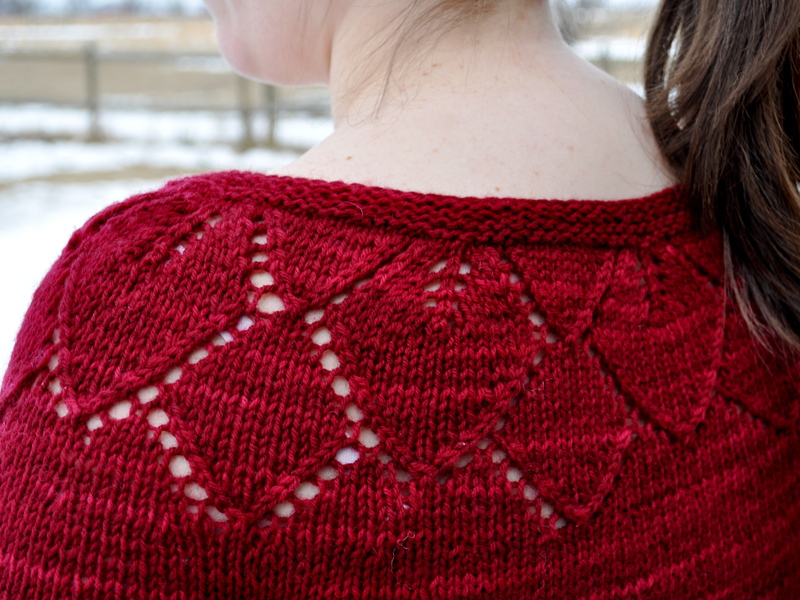 Although the pattern is written at an aran gauge, I think that it would also look nice in a smaller gauge with more repeats of the petals. The flower motif instructions are charted as well as written out line-by-line. 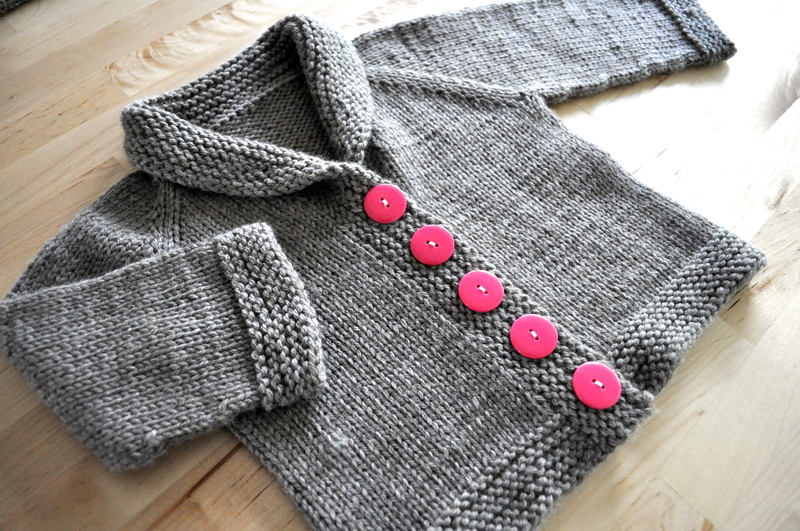 The pattern is available for 6.50 (USD) as a download in my Ravlery Store or through Paypal. Just click below! 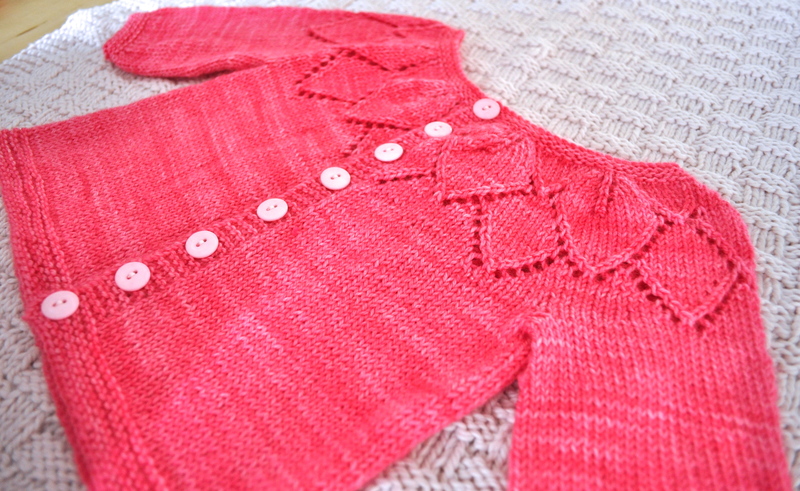 And if you do decide to knit Estelle, I always appreciate feedback!